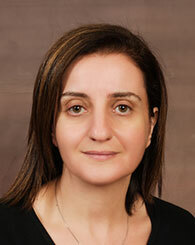 Mary Habib is a lecturer of economics. She holds a PhD in Economics from the American University in Washington, D.C. and a bachelor’s degree in Biology from the University of Maryland. Her research interests are related to international trade for developing countries, the World Trade Organization, intellectual property right, and the economics of technology transfer. Prior to joining LAU, she worked at a private international consulting firm in Washington D.C., where she served as a contract administrator for overseas projects funded by the U.S. Agency for International Development.